Yes I realize that these three things sound entirely random at first glance. However, upon deeper inspection....hmm....nope still unrelated to each other except that all three have happened today. Well, technically yesterday. This is where the insomnia part makes things a little squirrely. Let's start from the beginning shall we? A call from the school nurse about your autistic son having an inflamed ear canal is a quick way to get you out of work and on the road. I love the child and all but he can be downright difficult when dealing with pain or unfamiliar sensations. An inflamed ear canal definitely falls under both those categories. 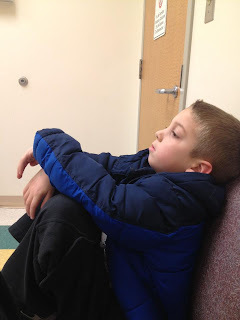 I knew that if my deeply seated love for him was not enough to keep me from wanting to dose him with codeine laced cough syrup to stop the whining and crying, I can only imagine how the poor people at the Boys and Girls club were going to feel. Not to mention the other kids. And last but not least in my frenzied race to pick him up was the certain knowledge that clinic waits are always longer in the afternoons. Longer the way that I imagine the waiting room outside Hell would be: germ covered plague ridden strangers (I have some germ issues....), random unrestrained children, uncomfortable chairs, bad television with barely audible sound, too hot OR too cold, and always with a faint unpleasant odor you can't really identify. I was not only 100% correct about the wait....and the conditions therein, but I had the added pleasure of extremely bored children. Two of them. Right there in the uncomfortable chairs next to me. Hungry, bored children that were so hungry and so bored that not even the barely audible episode of Sponge Bob was solace. I could fix one of their woes. I still had my snacks from work that I had been unable to consume. However, fate decided to pour salt in the tiny little wounds by sending in two slightly older boys carrying smartphones and clearly playing SOMETHING on them. Cue the longing looks at my phone; my phone with the dying battery. Nope. Not gonna happen, my tiny muchachos. There really is nothing sadder than a junior gamer nerd who is stuck in medical purgatory with no games. Alas, he was also cursed with a mother who's give a damn was just not working at that juncture. We were all suffering. Some of us more than others obviously, but still. Needless to say, by the time we got out of that office, we felt like prison parolees on our way to freedom from the big house. They were even happy to do their homework when we got home! It's the trials and tribulations that make us appreciate the little things in life, right kids? 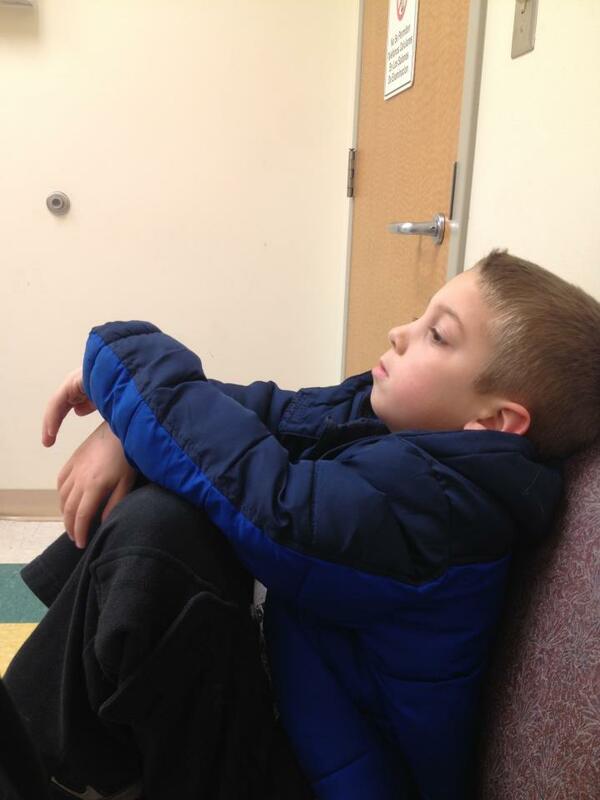 So, the doctor confirmed that the eldest son has a raging ear infection and he gets to stay home today. He also gets to take the pink antibiotic which hasn't changed one iota since I was a child. I find this oddly comforting. You know the stuff: pink liquid amoxycillin. Has the consistency of a runny milkshake and tastes like the color pink (don't ask, I just have no other way to describe the flavor). It has to be refrigerated and is so damn potent that ingesting any more than two teaspoons every twelve hours is highly forbidden. Still exactly the same as it was 30 years ago when it was me taking it. When I initially filled the syringe with the medicine, eldest son became quite concerned and asked if it was a shot. I found this amusing and fought the urge to make some crack about jello. He took the first round like a champ. He is not happy that he has to stay home from school today (weird kids, right?). He is excited to see his Nana this weekend (more on that later, but spoiler alert WE'RE GOING TO JACKSON). And he doesn't know it yet but he gets to run errands with mom this morning so not a total loss. As for me, this will be a coffee fueled day. I have been awake since 2:30 in the morning. It took awhile, but I finally conceded that insomnia was winning the battle and decided to get out of bed. I chose "productivity" over "futility". I made a chore chart for the kids in the hopes that the promise of money in exchange for services rendered will convince them to do certain activities with far less feet dragging and whining. Feel free to laugh now. It's okay. I am laughing, too. Although, in my case it may be sleep deprivation taking it's toll. Hope you have a great Wednesday. It is Wednesday, isn't it?